As another Sun employee, Erwin Tenhumberg, pointed out in his blog quoting a KOffice developer, OOXML’s goal is compatibility with one particular application — Microsoft Office. Therefore, OOXML is very closely related to and dependent on the Microsoft Office implementation. 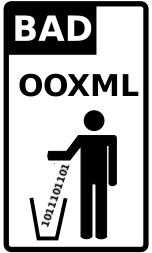 In contrast, ODF is based on the OpenOffice.org XML file format, not the OpenOffice.org implementation. In other news, there are prizes being offered and distributed which urge developers to support OpenOffice.org. Sun Microsystems has published some details about the Open Source Community Innovation Awards it announced in December of 2007.